NASA plans to launch a new exoplanet satellite called TESS on 16 April 2018. It is expected to discover thousands of exoplanets around nearby bright stars. Members of the NCCR PlanetS are involved in the NASA project and synergies are expected between TESS and CHEOPS, the space mission under co-leadership between Switzerland and ESA. Like CHEOPS, the Nasa satellite is going after the brightest stars in the sky and will look for transiting exoplanets that pass in front of their stars and cause periodic dips in brightness. 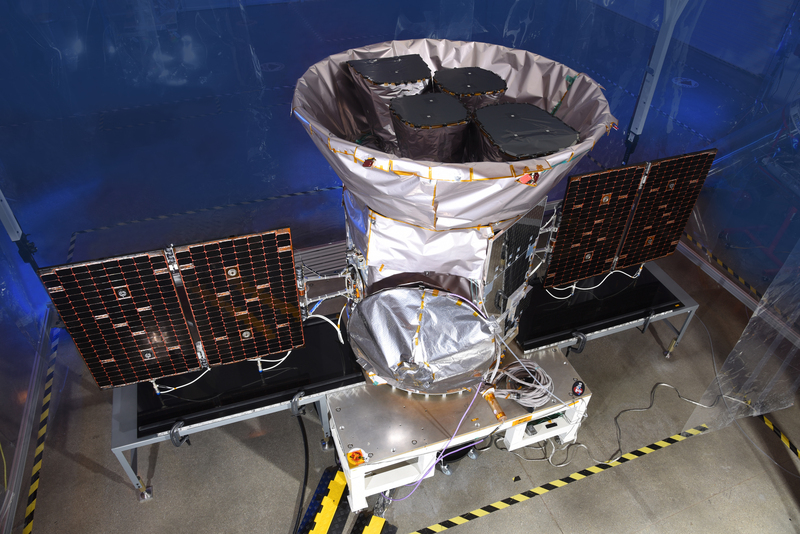 TESS stands for “Transiting Exoplanet Survey Satellite”, CHEOPS means “Characterising Exoplanet Satellite”. So, TESS will scan nearly the entire sky to monitor more than 200’000 stars and is expected to find at least 2000 exoplanetary systems whereas the aim of CHEOPS is not to make new discoveries, but to measure the size of exoplanets that are already known. Therefore, synergies between the two space missions are expected. There will also be a huge effort of ground-based follow-up observations to confirm and characterise the TESS planet candidates. “We are preparing several programmes and proposals,” says François Bouchy, professor at the University of Geneva, member of PlanetS and TESS collaborator. The Genevan team has already committed to devote observation time with the Swiss Euler telescope in La Silla in Chile for the TESS follow-up. Its spectrograph named CORALIE is able to characterize giant exoplanets and check whether smaller candidates are real or blended eclipsing binary stars that mimic a planetary transit signal. The robust smaller candidates will be observed by HARPS, the spectrograph mounted on ESO’s 3.6m telescope in La Silla. “At the moment we are polishing the HARPS proposals that have to be submitted to ESO by the end of March,” says Stéphane Udry, professor at the University of Geneva, co-director of PlanetS and TESS science co-investigator. If a TESS target is too faint and difficult for HARPS, the astronomers plan to use ESPRESSO. “The new high-precision spectrograph at the VLT in Chile will be able to characterise the smallest TESS candidates with a radius of only two Earth radii,” explains Francesco Pepe. The professor at the University of Geneva is lead scientist for ESPRESSO and also TESS collaborator. Since many objects observed by TESS will be cool red dwarf stars, the astronomers eagerly wait for the near infrared spectrograph called NIRPS that will start operation next year in La Silla. For the northern hemisphere, they will rely on the new near-infrared spectropolarimeter SPIROU on Mauna Kea in Hawaii. “We are involved in different consortiums that have access to facilities with guaranteed time observations including SPIROU,” says François Bouchy. At the moment, TESS is waiting at the Kennedy Space Center to be launched on 16 April 2018 (or later but before the end of June 2018) from Cape Canaveral on a Falcon 9 rocket manufactured by SpaceX. Originally the launch was planned for March, but SpaceX requested additional time for hardware readiness and to meet NASA launch service mission requirements. Both, TESS and CHEOPS will have very unusual orbits. The orbit of TESS is highly elliptical with a greatest distance to the Earth of 373’000 km and a 2:1 resonance with Moon’s orbit which means that the spacecraft will orbit Earth once in 13.7 days. This guarantees an unobstructed view, high stability and low-radiation. CHEOPS follows the day-night-terminator at 700 km always pointing away from the Sun.